It was on July 23, 2015 when NASA had first announced the sighting of a planet almost the same with our very own planet Earth. The so called Earth’s cousin is named Kepler 452-b. The discovery had taken the interest of many. For 20 years, the Kepler project had been looking in the outer space and they finally found a planet close to the characteristics of Earth, also orbiting around a star just like our sun in an almost similar distance. 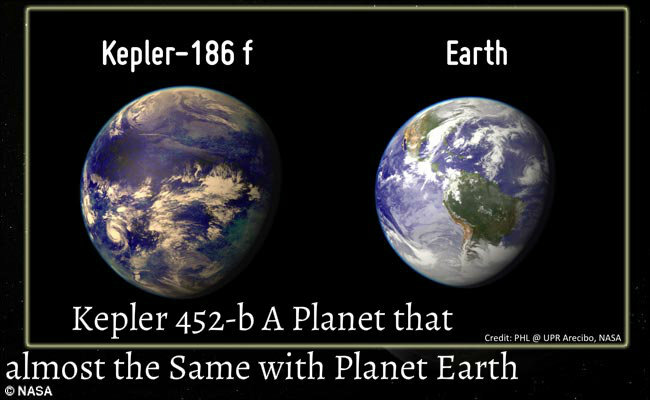 Kepler-452b is 60% larger than our home planet and may be one of 1,000 exoplanets. Exoplanets are thought to be habitable planets with the same characteristicas on Earth such as water and mountains. NASA also mentioned that there is a possibility that there are more planets such as this. The discovery of the planet may also make the chance of extra-terrestrial life a higher possibility. How far is this planet? Keplar-452b is around 1,400 light years from Earth. If each light year is 5.88 trillion miles, this means that it is no short distance. A light year means the distance light can travel in a year. If we can travel as fast as light, then we have to travel 1,400 years to get there. The question whether it is habitable and conducive for human colonization is still unanswerable. It is a fact that scientists and researchers have limited data and it would take 25 million years for people to get there. Also, assistant professor at Hokkaido University, Elizabeth Tasker, shared that it may as well resemble Venus with limited data at hand. The size difference can also mean a difference in gravitational pull. Still, many still thinks that the discovery of the planet can lead to discovery of other extra-terrestrial life.